The Paraguayan guitarist and composer Agustin Barrios was an admirer of European classical music and followed its principles also in his works. He is sometimes called the Chopin of guitarists. 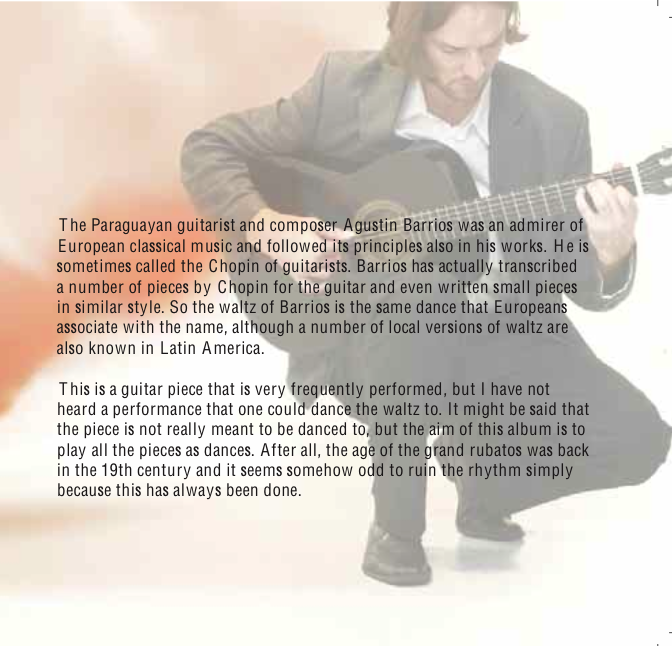 Barrios has actually transcribed a number of pieces by Chopin for the guitar and even written small pieces in similar style. So the waltz of Barrios is the same dance that Europeans associate with the name, although a number of local versions of waltz are also known in Latin America. This is a guitar piece that is very frequently performed, but I have not heard a performance that one could dance the waltz to. It might be said that the piece is not really meant to be danced to, but the aim of this album is to play all the pieces as dances. After all, the age of the grand rubatos was back in the 19th century and it seems somehow odd to ruin the rhythm simply because this has always been done. This is my favorite zBarrios waltz and this rendition is even better Than John williams simply gorgeous I play the 1st one does anyone else?